Rather than demand that they go out and buy issues – or take out individual student subscriptions – Tullett took the bold step of ordering a ‘bulk subscription’ (the scheme now known as ‘Eye on Campus’) so that every student in his class would get a new copy of Eye, delivered to the college and given out by Tullett and his colleagues at Lincoln. Barrie Tullett with Eye 1 and Eye 97. 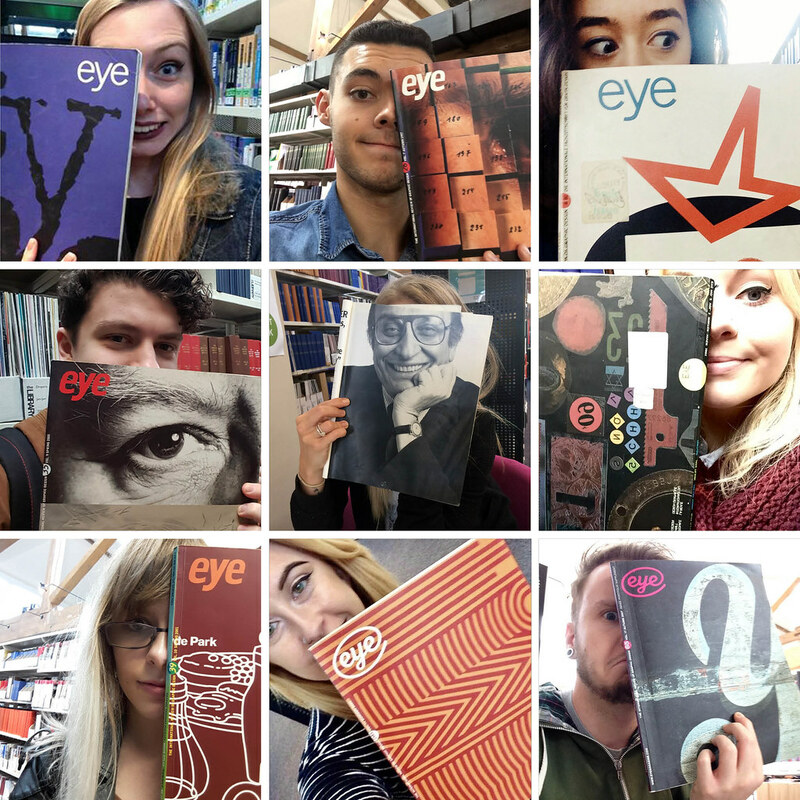 All other selfies taken by graphic design students from the University of Lincoln with back issue of Eye. 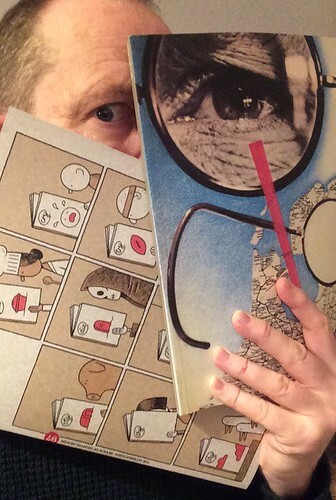 Tullett is a long-standing Eye reader, with a complete set of issues starting with Eye no. 1, published in 1990, when he was 25. He also uses back issues of the magazine as a teaching tool. For one assignment students were given a randomly selected issue number from the back issue collection in the Lincoln Library and were then asked to go and read it. He insisted that they take selfies with the issue to prove they had done so. The conversation about the back issue formed the basis of their first personal tutorial sessions. Tullett’s colleague Jeremy Goffin, the first-year course leader, set the students a questionnaire, to see how thoroughly they had read the magazines. It included three important questions – favourite article, favourite paper stock, favourite typeface. One of the things both students and teachers liked about the Eye archive was that much of what Eye has covered over the years is still not easily found on the internet. The students enjoyed discovering little-known designers from the 1990s and early 2000s, searching them out online, and discovering that they were still doing good work. Subjects that grabbed their attention included early motion graphics, a profile of editorial designer Derek Birdsall and the Reputations interview with Milton Glaser. Tullett also notes their growing realisation that many of the graphic techniques and effects they were familiar with from the computer were decidedly analogue in origin – things that designers devised with their hands in the studio; in darkrooms; and on press. 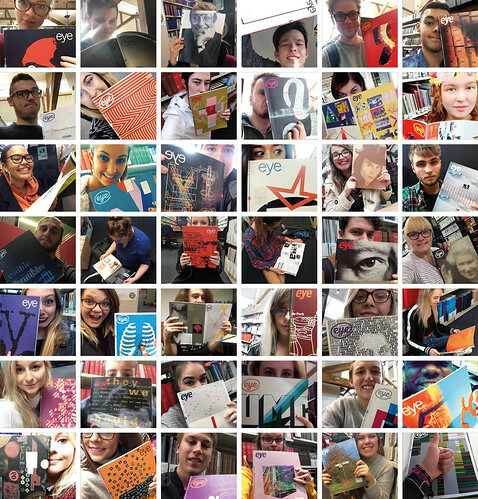 The students enjoy getting their new copies of Eye, and often show their appreciation via social media. 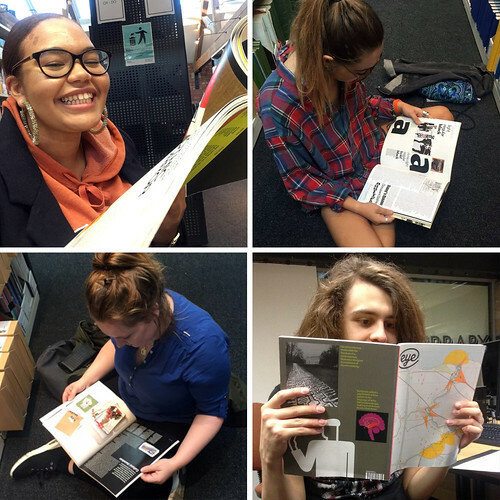 ‘It’s always a nice day when the new copies of Eye arrive,’ says Tullett, ‘a proper treat!’ He notes that the students relish the tactility of print – all the different paper stocks – even before they look at and read the magazine.